Many vehicles took on second lives: a storage facility for empty beer cans, an emergency wild animal refuge, a “secret” clubhouse or a play pen for the children (why pay good money for a flimsy plastic steering wheel toy which honks when you have the real thing in your yard?). Sometimes a teenage boy would get a hankering to fix one up and maybe drive it into a barbed wire fence. Most parents didn’t worry about this since it kept the boy out of trouble; they knew he’d be grown before he’d actually get the car running. Miniatures inside the car and a grasslike ground cover add additional realism. This is truly a no-fail, no-pressure project: the more horrible the car looks, the better! If a few parts don’t get glued on right, you can simply toss them in the passenger compartment – just like real life! And if the ground cover or fern die, you can simply tell people that there was a drought or plague. You may find that this project increases your productivity. Gazing at your garden a few minutes each day will give you a much-needed break and let you regain focus and clarity. Additionally, you’ll have more time on hand, since people will quit talking to you because they’ll think that you’re strange. In this, the first of a three part series, we show you how to choose plants and prepare the pot. In the next two parts, we’ll show you how to make the car and the goodies which breathe life into the scene. Some vehicles may have a particular emotional connotation, depending on your life experiences. 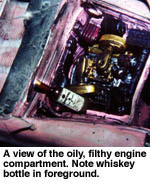 Some types of vehicles are inherently tacky or will have other features that you will admire. Barring that, look for one that’s cheap or on sale. I’ve chosen one that’s elongated so that it will fit neatly at the back of a desk. My car, which has a finished size of about 8″, will fit diagonally in the pot. I’ve chosen a variety of fern which resembles a miniature tree and a ground cover which resembles overgrown grass. Look around and see what you can find that is cheap and captures your imagination. This is optional; you don’t have to paint the rim. If you do, choose colors in keeping with the era or style of your car. Turn the pot upside down. Mask off the rim with newspaper and masking tape. With the pot still upended, apply several coats of spray paint to the rim. It looks rather crisp, in a wide-cuffed 1950’s sort of way. I was going to do this, but got bored and wanted to do something else. Just pretend that I did it, ok? Each era has its own hideous motifs and colors – pastel mint and pink for the 50’s, avocado green and harvest gold for the 70’s. For inspiration, take a look at old advertising. Abstract geometrics in pinks and greens would have looked great on mine. Oh well. 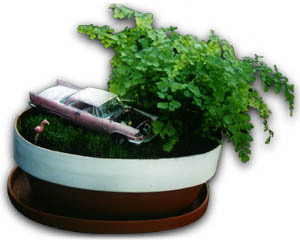 You should probably position the “tree” plant at one edge or corner of the pot, so as to leave room for the vehicle. I didn’t have enough ground cover for the whole pot, so I concentrated it in the areas not covered by the car. Done? Great. Now the plants can grow in while you work on the other stuff. Part 2 and Part 3? Nothing came up in a search.